Sherri Lynn Wood is the keynote speaker at this year’s Quilters Take Manhattan, the Quilt Alliance’s annual fundraising event in New York City. Also speaking at the Saturday, September 16 Main Event at the Fashion Institute of Technology will be Merikay Waldvogel and Michael A. Cummings. Women of Color Quilters Network founder Carolyn L. Mazloomi will interview Cummings for Quilters’ S.O.S.- Save Our Stories (QSOS), and Craft Napa founder Pokey Bolton will emcee. Sherri is a working artist based in Oakland, CA. Most recently she completed a four-month residency at Recology San Francisco with the task of presenting a body of work made completely from materials scavenged from the city dump. She has been making quilts and facilitating improvisational patchwork as a restorative life practice for twenty-five years. 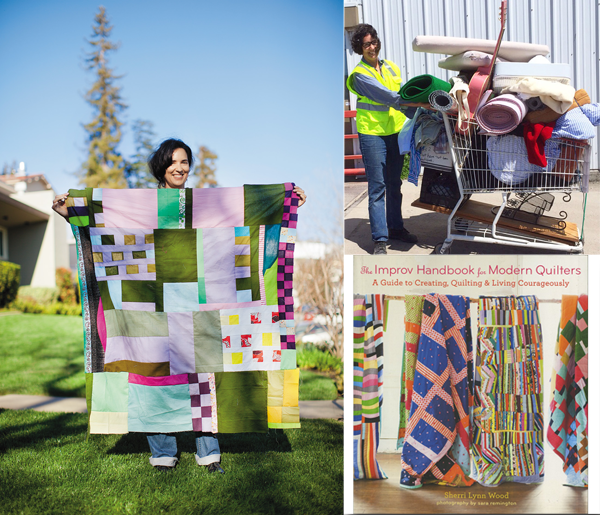 She is the author of The Improv Handbook For Modern Quilters – A Guide to Creating, Quilting and Living Courageously (Abrams 2015). We recently asked Sherri to answer five questions we ask quiltmakers as part of our QSOS oral history project. 1. What is your first quilt memory? Sherri Lynn Wood (SLW): One of my father’s co-workers in Richmond, VA, named PT for Hiram Petty Thomas, had a farm in South Hill, Virginia, which he visited every weekend to work it. Sometimes our whole family would visit PT on the farm just for a day. One summer when I was 9 or 10, I rode up one weekend with PT and stayed for a whole week with just his Aunt Helen and his mother Florence. PT returned the following weekend and brought me back with him. Helen and Florence ran a florist business in South Hill and maintained the farm some. During that week they took me to their neighbors house, one farm over, to a quilting bee. The hostess lowered a big frame from the ceiling and Florence, Helen and two or three other women sat around and quilted for the afternoon. I remember peeking underneath and waxing thread, and then threading the needles. When we were back at PT’s farm, Helen always had a sewing machine set up on the dining room table with stacks of diamonds, or squares, or triangles ready to be stitched whenever there was a free moment. They showed me how to chain stitch the patches, and that, I think, was the first time I ever sewed on a machine. I bought my first sewing machine when I was twelve, but didn’t make my first quilt until I was 24. 2. Have you ever used quilts to get through a difficult time? SLW: Yes, actually. I became depressed, and I dropped out of divinity school at Emory University around the age of 24 and I took up quilting. I loved it so much that I got a booth at the local farmer’s market and began making quilts for sale. I had always thought I would be a minister, and when I dropped out of school because of the depression, I was without a sense of identity. Quilting was hands on and very soothing, and eventually led me into becoming an artist. Over the course of my career and as I’ve become more healed myself, I’ve consciously chosen a trajectory of service and healing with my art and quilting practice. Also, fun note – seven years after dropping out of divinity school, Emory accepted one of my first major bodies of art work, “Parable Quilts,” for my masters thesis and awarded me a Master of Theological Studies. 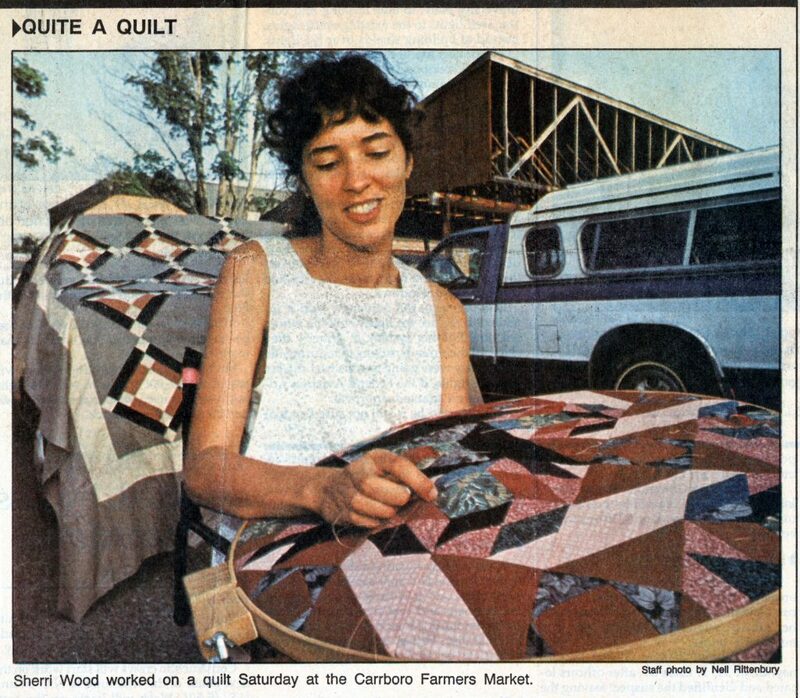 Sherri Lynn Wood quilting at the Carrboro, NC Farmers Market in 1989. 3. What are your favorite quilting tools? SLW: Well, I have so many favorites, but let’s start with scissors since they seem to have taken a back seat to the rotary cutter. I still use my rotary cutter but there is so much I couldn’t do without my scissors. Since I do not use rulers to square blocks up, as my quilts get bigger I have to use my scissors to cut large sections and rows to match before I flip and sew. I always list SHARP dressmaking shears on my list of supplies for students, and am always dumfounded by how many people ignore this staple tool and bring dull or an itty bitty pair of scissors to class. Scissors are also necessary for cutting clothes apart, which I do a lot in my make-do and passage quilting practice. I also love my 15 year old straight stitchin’ and shootin’ Juki. It’s still going strong! Can’t live without my Q-Snap floor frame, also at least 15 years old, for hand quilting. 4. What do you think makes a great quilt? SLW: This is a great question and my answer is the rhythm of the maker’s attention. Another way to say that is honesty, or limbic resonance, or making relationships from a soul level. I’m all about flexible patterns and following internal cues to improvise patchwork. The more honest I am with myself, the more present I am to my emotions, habits, desires, joys, and challenges as they arise, the better the quilt. There is a lot of emphasis in the quilting world and the broader culture on good design, but my emphasis is on self-discovery, seeing my patterns. My goal is to get my design-planning brain and ego out of the way so that the patterns can flow as immediately as possible from a soul level. It’s not so easy to do! For me it’s a life practice. When I see this kind of soul-level honesty, this kind of deep rhythm of attention in another person’s quilt, I’m in awe. 5. What do you think is the biggest challenge confronting quiltmakers today? SLW: I may have answered that on a personal level in the question above. However, on a community level, I think quilt makers are diverse politically and it’s a rare opportunity these days to work side by side and share a similar love for a craft or activity, with people who have opposing political views. I think the biggest challenge may be for us to continue to explore, understand, accept and celebrate our differences rather than ignoring them, as well as celebrating our similarities. I would love to see the community of quilters to continue to grow in diversity in the areas of race, age, gender, nationality, and class. I think it’s great how guilds come together to make quilts for other people who have suffered or are at some disadvantage, but what I would like to see more of is these same quilters going out and quilting WITH these communities, like refugee communities, or with homeless populations for example, rather than for them. There is so much potential and infrastructure that has barely been tapped for social change, systemic healing, and growth for guild members and the broader communities they are a part of.